It was quite a task searching for tickets for my return journey from Hyderabad after the Annual Pharmacists' Gathering - the Indian Pharmaceutical Congress. I had a ticket by a late night train from Hyderabad - but I wasn't very keen on making that train journey. I had the option between buses and trains, but being a long weekend, buses were quite expensive. I looked at flights, but the direct ones were selling at high fares - I wasn't very convinced about paying such amounts for an hour long flight. For a moment, I looked at fares via Chennai, and the total fare that way worked to less than half of what I'd have to pay for a direct flight! 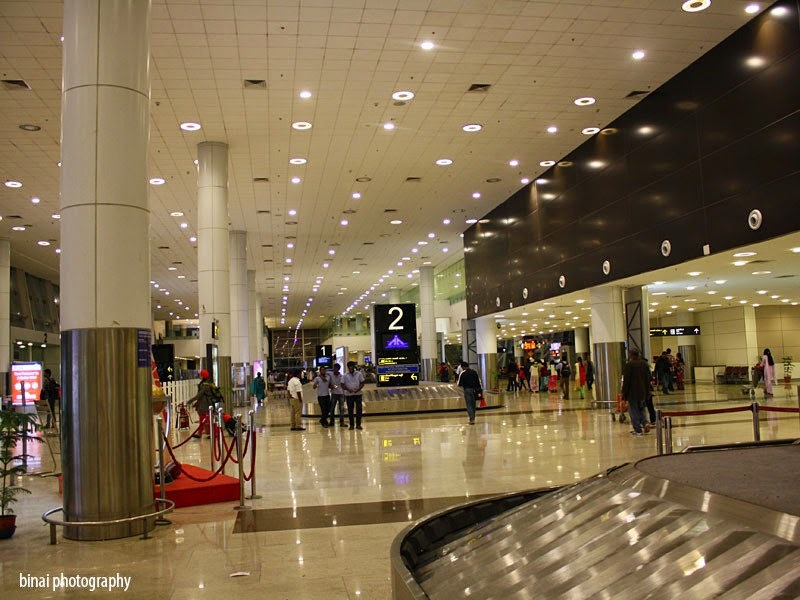 I quickly checked accomodation options in Chennai, and found one that was cheap, with free airport transfers. The booking was made separately, and finally got a HYD-MAA ticket on Indigo, and MAA-BLR on Jet Airways. I limped out of my hotel room in Madhapur - a mid-foot sprain had left me limping since the past three days. It was a painful walk - but the hotel was at a good place and getting an Auto was not at all difficult. 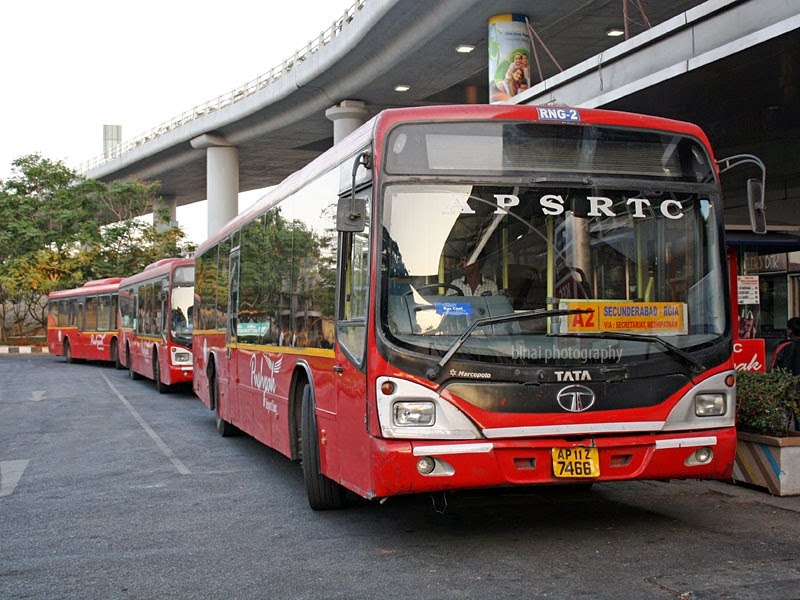 I took an auto to the nearby Airport bus (Pushpak Liner) pick-up point - and I got a bus from there very soon. It was a rickety bus - it took about 45 minutes to reach the Airport. I was at the airport by 1745hrs. I wanted to explore the airport a bit, but my leg wouldn't let me do that. The entire layout appeared very confusing to me. 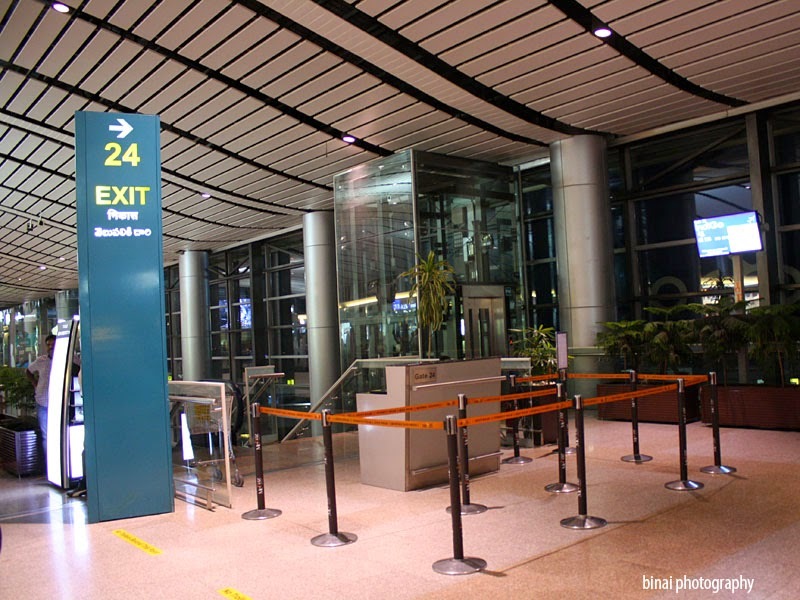 The airport is separated into levels - the ground floor doesn't have any entry points. The First level has the Arrivals and the second level has departures. The taxi stands, and bus bays were at the lowest level - there are escalators and elevators to take one up. The first level gives an amazing view of the apron - I did want to spend some time there, but desperately wanted to sit down, thus heading to the second level. The rush to enter into the terminal building. There was one long queue to get into the terminal - the area appeared very congested - there is hardly any place to stand. It took about 10 minutes to get into the terminal. The check-in desks are divided into zones, and the Indigo ones were in Zone E. There were long queues at the check-in gates. For a moment I thought I'd use a self-check-in kiosk and get a copy of my boarding pass - but even those were crowded! I joined the regular check-in queue - it was long, but was moving fairly fast. Indigo agents gave preference to passengers who had flights departing within 45 minutes - but they ensured that they kept a separate counter for them. Ms. Pavithra was manning the check-in counter - She gave a long smile, a warm good evening, and confirmed my travel information - I informed that I had received an AdvancePass but couldn't print it - she reconfirmed if I wanted a seat change and printed out the boarding pass for me. She informed the gate number and boarding time before handing over the pass to me - she even pointed out the the stub of my checked in baggage tag was stuck behind. The security hold - or a mall? Security check gates were right next to the check-in gates. Only one scanning machine was running, while frisking happened at two gates. Security check was quick - I was inside the security hold by 1821hrs. 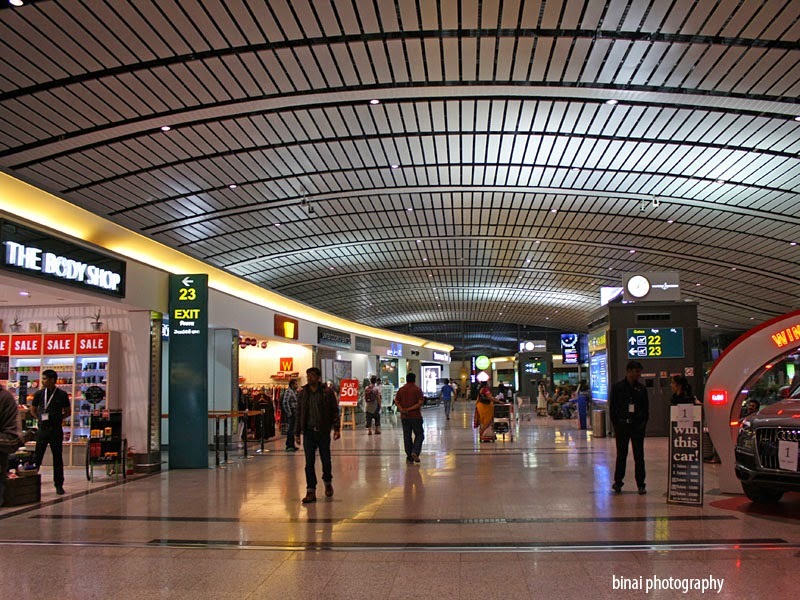 The waiting area resembled a shopping mall than an airport terminal - there were all kinds of outlets right from eateries to silk products to pearl products to electronics. All the gates were numbered in two digits, beginning with 2. I believe the 20s numbering is to differentiate it from the international terminal. My flight was from Gate 24 - so my first priority was locating where this gate was - seating around the gate was full, and moved forward and peacefully settled on an empty chair. 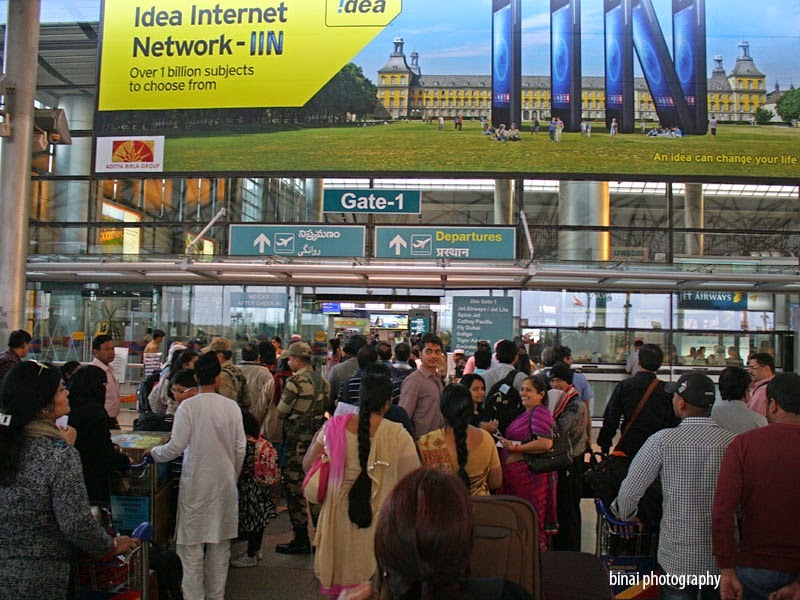 I tried connecting to the Free WiFi - but like in Bengaluru, it wouldn't connect. A little later, I used the washroom - this place is a let-down to the posh and exotic looking terminal - old styled wall-tiles, lack of dry areas to keep you hand baggage. Later, I headed to the food court side - I was attracted by Idli Factory since I preferred having something light. After a light meal, I was back at Gate 24. I was tracking my aircraft, and I understood that the aircraft was nearing Hyderabad. 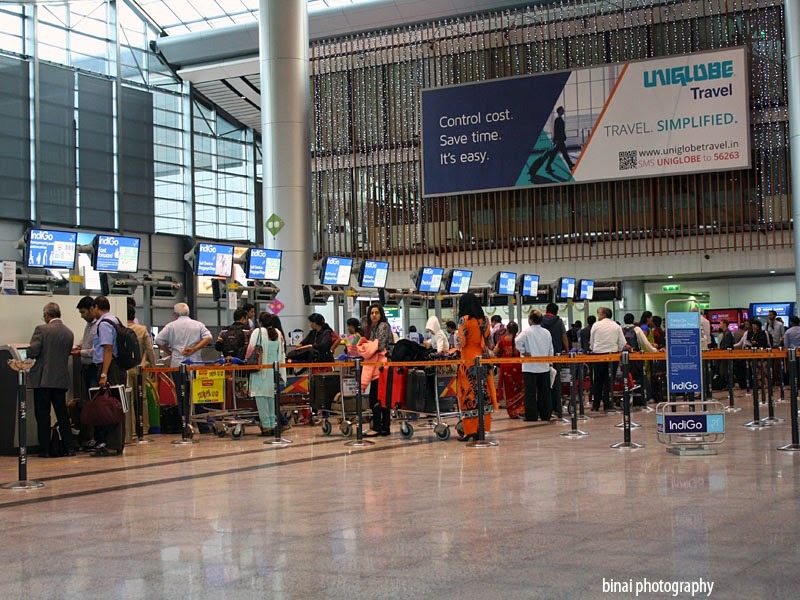 Unlike Bengaluru, Hyderabad airport had an automated announcement system - prerecorded announcements were being made (Bengaluru is a Silent airport). Boarding was announced at 1940hrs - zone-wise boarding was enforced. Passengers in rows #21-30 were called first. I was in #10F and hence sat down for some more time - till the crowd thinned out. I passed the gate at 1954hrs - one first takes an escalator down to the first level, then passes a layer of checking by CISF personnel, then a long walk through the jetways ot the aircraft. There is one more layer of checking - this time by airline staff - before you can step into the aircraft. There was a traffic block inside the jetway - we moved very slow. I was inside the aircraft at 1959 - Purser Aaznia welcomed passengers with a warm smile. I was flying on VT-IFR, an Airbus 320-232 delivered to Indigo in August 2013 - just about a year and a half old. IFR ensured that my record with Sharklets and new registrations continued! I got to my seat - like everytime, my co-passengers were already seated. 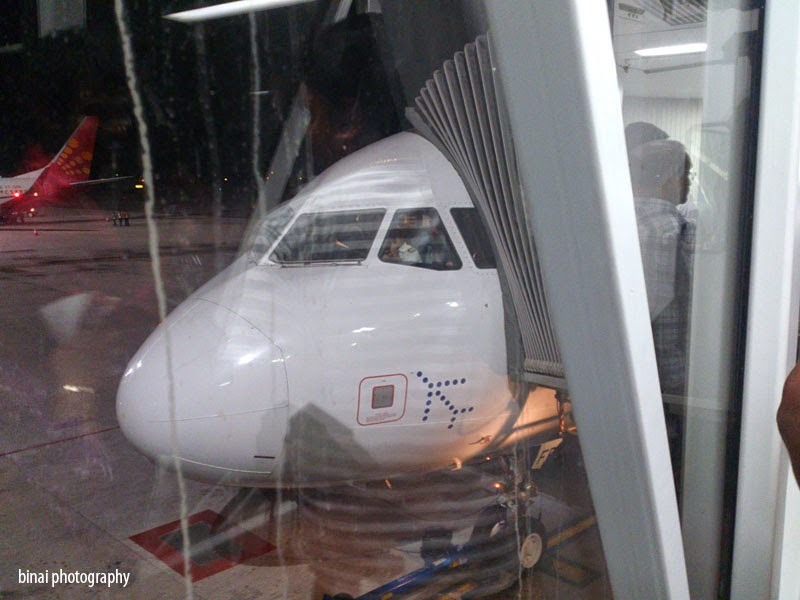 Boarding was completed at 2003hrs, and we were all set to be pushed back. We were pushed back at 2005hrs. Right after pushback, safety demonstration began. As usual, a flurry of announcements began - first welcoming passengers to Indigo Flight 385. In command was Capt. Vijay D'Souza along with First officer Capt. Vikram Bal Singh. In the cabin were Aaznia, along with Anju, Poonam and Rohini. The safety announcements were pre-recorded. This was followed by a brief introduction to Hello 6E, Indigo's on-board catalogue. This was followed by an announcement requesting passengers to make most of the time by selecting what to buy! By 2010, we were taxiing towards the runway. There was a Spicejet B738 (VT-SPK) ahead of us. 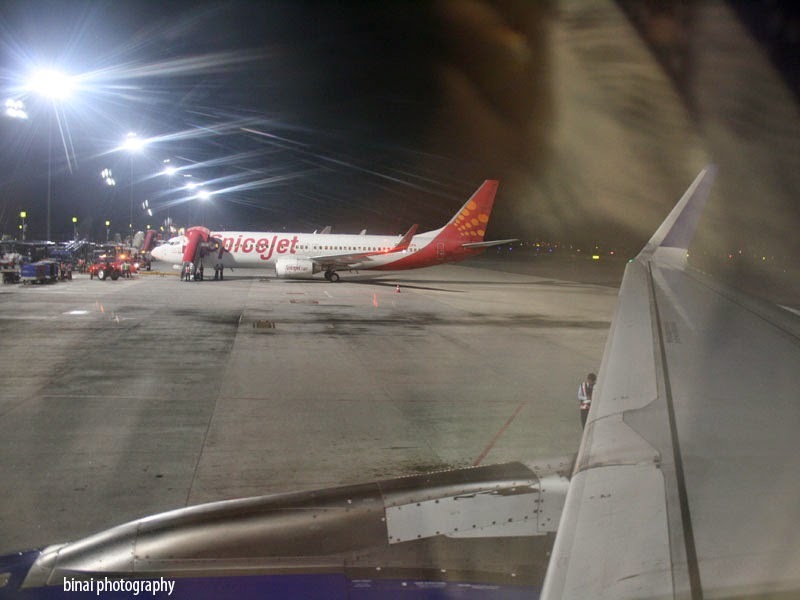 We had to hold at A8 for a couple of minutes, to allow a SpiceJet Q400 to land. We finally took off from Rwy09R at 2018hrs. Soon after the seatbelt signs were switched off, another flurry of announcements began - starting with the Seatbelt sign has been switched off... announcements, followed by the announcement for their Buy-on-board announcement. I had pre-booked for a Veg Meal with Non-alcoholic beverage. Although it was announced that passengers who had pre-booked a meal would be served first, my meal took its time to arrive. The attendents were quite mechanical - in fact to the extent of frowning at a customer for not keeping his order ready. 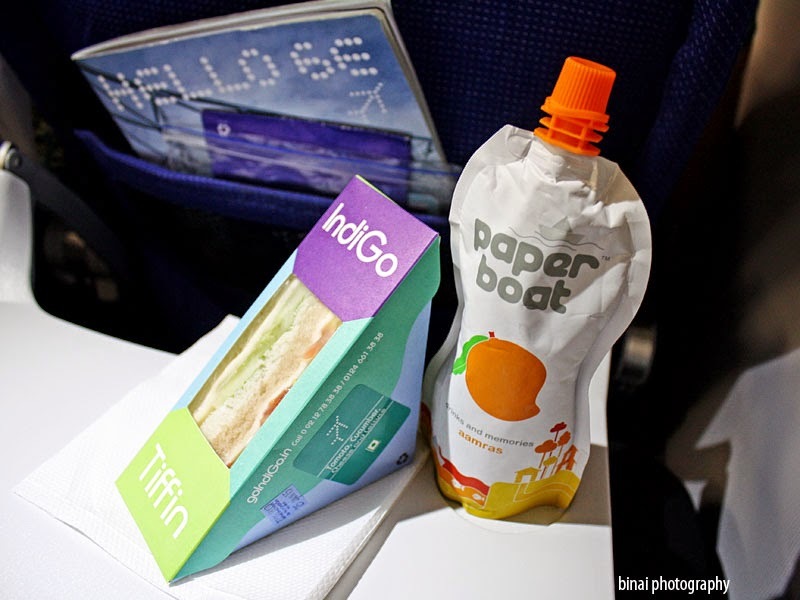 I preferred a Veg Sandwich with a 250ml pack of Paper Boat Aamras. I don't think this would qualify being called a "meal". The sandwich was good - soft bread with fairly good filling. Soon after the buy-on-board service was over, they began a round of clearing - of course, preceded by the announcement, Samay par rahna anivarya hai (Its important to be on time)... requesting passengers to co-operate by keeping the aircraft clean and prepared for the next sector. The captain came on the PA in-flight and briefed passengers about the flight - we were flying at FL330 at that time, and as he was speaking, we began our descend. He explained that we took off from Rwy09R, flew East, then turned Southwards. He added that we'd be landing before time, yet again and bragged about their on-time performance and before time arrivals. 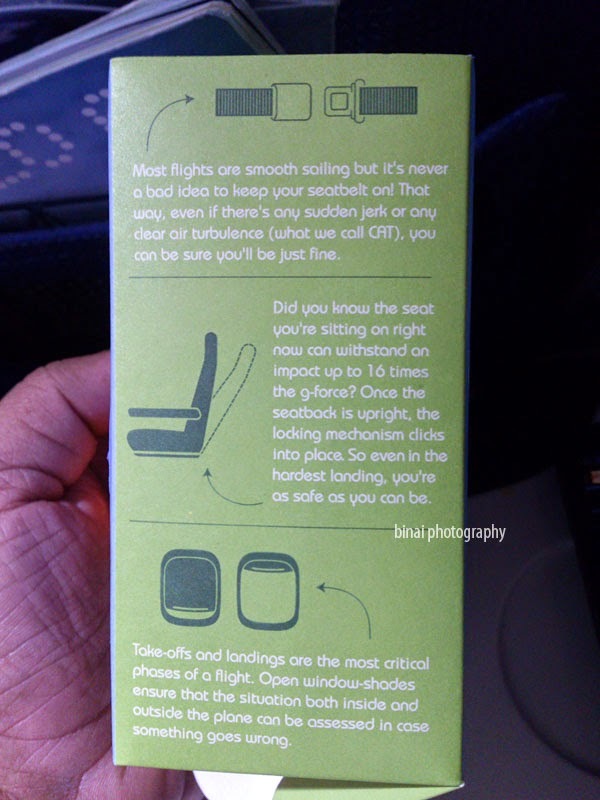 The seatbelt sign came on at 2101hrs, followed by the landing announcement at 2103hrs. I was expecting us to approach Chennai from the sea side, but we banked to the right and flew towards the west before turning around and aligning to approach the airport from the West. We finally touched down on Rwy07 at 2112hrs. As we exited the runway, a Mihin Lanka aircraft took off, followed by a Jet Airways aircraft - both were narrow bodies. It was a long taxi to reach our stand (#19) - we finally docked at the stand at 2117hrs. I remained seated till most of the crowd got out - very few passengers remained in the aircraft (the aircraft continues to Pune) as I walked out (at 2123hrs) - Indigo personnel verified the boarding passengers at the exit. It was then a long walk to the baggage carousel - the arrivals was at the first level, while the baggage carousel was at the ground level. I got my bag 2131hrs, and I was out of the airport at 2132hrs. The hotel's transfer cab was waiting outside for me. There ended another no-nonsense flight with Indigo - now the largest carrier in India in-terms of passenger share. The flight was on time, clean - the service lacked warmth though. They did their job efficiently, but no smiles (except from two of the four attendants). The aircraft had the new Recaro Slimline seats - these seats appear very thin, but offer excellent comfort (personal opinion). Being thin, the seats release a lot of leg room as well. This made for a comfortable ride.